One of the most popular sites in Ketchikan is the Saxman Totem Village. This is Ketchikan’s largest totem park with 29 authentic totems carved by Tlingit and Haida natives. The poles were moved here from the original site in the 1930's and have been restored by native carvers. They are a must see when visiting Ketchikan! The next part of your journey will continue on to Herring Bay, a quaint area that takes you far away from the crowds and people. This is a small inlet cove that will allow sights and sounds of the beautiful wildlife that only Ketchikan can offer. During Salmon season, Black Bears, Eagles, Herons and Seals are often spotted in this area. Be sure to keep your eyes wandering and your cameras close! 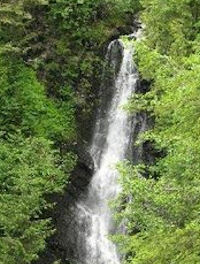 Your next stop will include a visit to Rainbow Falls. Immerse yourself in the beauty of a 100 foot waterfall surrounded by a rainforest. This hidden treasure is well known by the locals, but not by tourists. Your last stop of the day will be at Creek street, where your guide will talk about the ladies of the night of years ago. You’ll then have the option to go through world famous Dolly’s house museum or we’ll return you to your ship. Note: Children prices are valid for ages 4-12. Ages 4 and Under are free.